NHL.com sat down with NHL Deputy Commissioner Bill Daly to clear up some of the issues surrounding the expiration of the player transfer agreement. Watch NHL.com's Draft Channel now! 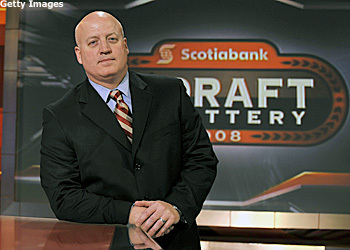 The recent expiration of the player transfer agreement that governs the movement of players from European leagues to the NHL and back has raised many questions, especially regarding how European-born players will be treated in this weekend's NHL Entry Draft. to discuss some of the issues that have been raised in the past few days. Below is a transcript of that conversation, which took place Thursday in the lobby of the Brookstreet hotel in Ottawa. NHL.com: Obviously, the transfer agreement has been in the news recently. Many people believe that the lack of a transfer agreement will have a huge impact on the Draft. Can you talk about what you think that impact will be? BD: I'm not really sure what the effects are going to be. I think it has created a lot of uncertainty when it comes to European players and what those rights are in respect to European players. I'll be interested in how it plays out. NHL.com: There's been some talk that the European players will go back to "defected" status -- the same status European players had before the latest Collective Bargaining Agreement -- where the teams that draft these European players will hold their rights for as long as the team wishes to hold the player's rights. I understand that it will be a little different, but that is the general theory going forward, correct? BD: It's our position that in the absence of a player transfer agreement that we revert to defected player status, which existed before the new Collective Bargaining Agreement. Having said that, we understand we have an obligation with the Players' Association to negotiate over what those rights might be and we'll see how that negotiation process plays out. NHL.com: Now, that could be done through negotiations right now with the NHLPA or later on this year through arbitration, correct? what happens to them. For the most part, if they are under contract, those rights are told with our own clubs and we're going to negotiate what the resolution of those issues are with the Players' Association. If not, it will be an arbitration result. NHL.com: So, does the status of the European players drafted in 2004 or 2006 change, as well? NHL.com: That's essentially the way Russians have been treated since they weren't part of the last transfer agreement and that is going to change now, as well, right? BD: Actually, a little bit different. The Russian players, at the time that they didn't join the player transfer agreement after the lockout, Russian player status was kind of told, so that none of our clubs have lost rights to Russian players in the three years since the lockout. Our agreement with the Players' Association with respect to Russian-born players, those rights will remain the same. You can draft a Russian player, but you might not know if you will ever get the player out of Russia, but you will have rights to him. NHL.com: One of the big Russian players that everyone in this draft talks about is Nikita Filatov. He has said repeatedly that he is not under contract, but it appears that it might not be the case. But, he still has the right to come to North America next year, as far as the League understands it? BD: Again, I don't know the specifics. My understanding is that he does have a contract in Russia for next year. My understanding is that he has already declared his intention to unilaterally terminate that contract, which he has the right to do under Russian law and that's kind of where I'll leave it. I don't really know where that stands. NHL.com: Going deeper than just the Draft, can you just talk a little bit about what the lack of a transfer agreement is going to mean for European players that are free agents or would have been signed before the dissolution of the transfer agreement? BD: Well, obviously, our principal goal is to respect contracts of European clubs and we want them to respect our contracts, obviously. So, it becomes an issue of if he is free to sign in the NHL. I think, to the extent that we go any extended period of time without a player-transfer agreement, you will see more and more players have very short term contracts or have opt-out ability, so that they can come to the National Hockey League. So, long-term, we're not concerned with the player transfer agreement not being renewed. Short-term, there may be some issues with players that are ready to play in the NHL, want to play in the NHL and be under contract somewhere else. NHL.com: And, right now, there is no ability, as it stands right now, to negotiate a release, it has to already be in a European player's contract, right? NHL.com: On the whole, is it correct that the reason that the current transfer agreement fell apart because of the action of certain European clubs as far as most people understand it? BD: No, in fairness, I think over a period of time there were certain issues and dissatisfactions on both sides of the agreement. I think maybe it really deserves a re-think by everybody involved, including us, with respect to what we are prepared to do and what we are paying. Maybe, in fairness, it has run its course. The biggest complaint on the European side; two complaints. One, they didn't think they were being compensated enough; but two, there were too many players being signed to NHL contracts that weren't NHL-ready and were being assigned to the American Hockey League. That was a concern of the European leagues and that was something we accepted and actually agreed with in a lot of respects. NHL.com: This particular deal, though, fell apart because the Czechs would not agree to what the other countries had agreed to? BD: That's correct, on a very micro-basis. This agreement had been signed off on by the Swedes. Again, it was a one-year interim agreement that had been signed off on by the Swedes, which we thought was the biggest challenge and then the Czechs decided not to join the agreement. With the Czechs and Russians both out, it didn't make a whole lot of sense to go forward. NHL.com: Bill, thanks for your time today in helping to explain some of the issues surrounding the expired player transfer agreement.